The former Chief Minister of Bihar , Lalu Prasad Yadav performed a two-hour-long ‘tantra’ puja at the Pagla Baba Ashram near Mirzapur in Uttar Pradesh. Current CM , Nitish Kumar , was smelling conspiracy in Mid-Day Meal tragedy which killed 23 kids due to contaminated food at school. Any connections ? 😀 Interestingly,this tantra puja has been performed after the Supreme Court agreed to transfer the multi-crore fodder scam case to another judge, offering a greater relief to Lalu Yadav , as he is the prime accused in the scam. The judge who was currently handling his case is a relative of a minister in the Nitish Kumar and hence it was argued that decisions may be partial. Haha…I love it!! Love how see the fun side to it! let all be spared by God Vijay Ji on a condition that they do not repeat their crimes again . Amen !! The common man , whom will he doubt? Great interpretation and terrific sketch. common man I think is the biggest culprit allowing some among itself to become God of corruption .. what say ? 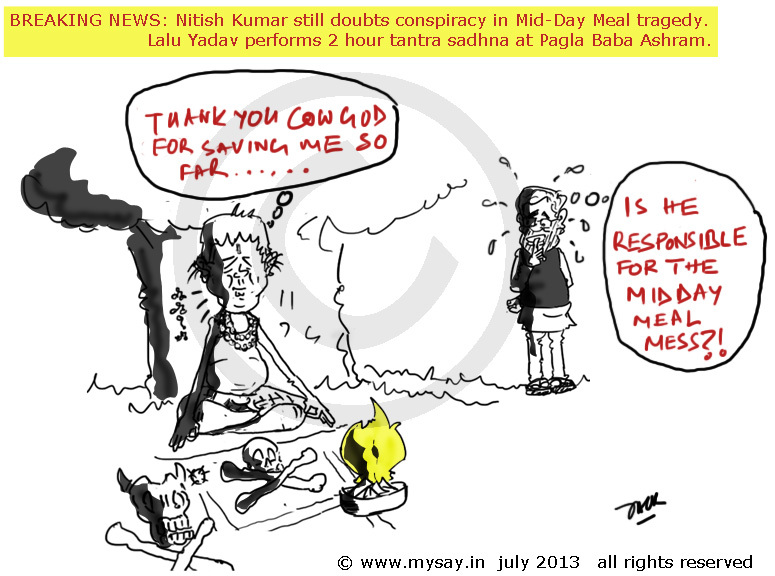 Lol…Lalu does pooja and children die….that’s the height of pooja.